A way th'lads. Geordie England star Peter Beardsley gets the tremendous honour(?) of endorsing the first Amiga football game. Not just any old football game too, but one based on the European Championships. Grandslam could not have picked a better time than to release this game, with Beardsleymania at its peak, and millions of people having been thrilled by the European championships. Does the game match up with all this entertainment? Before you kick-off you are given a rather nice little Peter Beardsley badge and poster to stick on your wall and lapels respectively. Once you're looking the part, run down the shop and score a few crates of McEwans and you'll all net set. Before you get the chance to kick a ball, you must decide which of the eight teams you wish to be, whether you want a one or two player game and how long you want your matches to last. At least when I chose England they managed to give me a white shirt, even if the shorts were the wrong colour! You control one of your team's players with an arrow sticking out of his head. Instructions state the player who is in control is decided by the one who is nearest to the ball. Note: the previous statement is a complete lie. The player who is in control should be decided by who is nearest to the ball, but isn't. This is the game's main fault, often you pass the ball directly to one of your team-mates and he will stand there with the ball at this feet, and his hands on his hips. This fault, which could have been easily corrected, ruins what could be a reasonably good football game, by making it impossibly to play decently let alone win (that is unless you know the Ferdy cheat mode - which I'm not going to tell you!). Apart from this fault the game is otherwise straightforward. You can pass and shoot to different degrees of power by holding down the fire button for different amounts of time. The goalkeeper can be made to dive in different directions, but this is not a wise idea as he only seems to be able to save it while standing up! Another of this game's intriguing features is every ow and again the computer team decides to stop playing completely, and they don't allow you to carry on either, so you have simply to wait until time runs out before you can continue. As you can see the game does have some very nice graphics, and it plays relatively smoothly too. Had more time been spent to make it playable it could have been very good, yet Grandstand confused their priorities and decided that ensuring all the teams had the correct away kits was more important. Which is why I'd sooner have put my money on Eire winning in Germany than buy this game. Liverpool's famous roving leftwinger, Peter Beardsley endorses this latest footy game, which sets up matches between a selection of European teams in an international tournament. Three qualifying matches are played before the knock-out semi-final, and then the European International Football Final, where your team could become the Champions of Europe! The team you represent is chosen from a selection of eight, and the players line up for the kick-off. To shoot or pass hold down the fire button till the required power level is obtained, then release the button to kick the ball in the direction faced. The footballer under control is (according to the instructions) the one nearest the ball, and is highlighted by an arrow above his head. 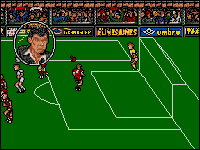 On a 16-bit machine, particularly the Amiga, you'd expect a game endorsed by the talented Geordie haircut to extend to something more substantial than a basic kickabout. Obviously Grandslam think differently, because that, unfortunately, is all you've got with Peter Beardsley's International Football. If you have the self-discipline to turn a blind eye to such shortcoming as poor playability, no fun and little variety, you might just manage to find the game mildly addictive. What it looks like Grandslam have done is convert International Soccer, put Beardsley's name and face on the packaging, and timed the release date to coincide with the football fever from the European Championships. The game graphics are well designed, especially the ref and commentator faces, but animation is unremarkable and there are some terrible sprite glitches. What's worse is the presence of that bane of computerised teams sports - the computer selection of the one player who isn't nearest the ball. 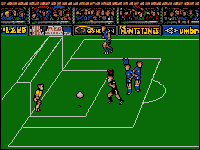 If you just want a 16-bit International Soccer, then feel free, but that's all you'll be getting for your 20 quid. A simple football game which doesn't take advantage of the Amiga's abilities. A number of useful options and good on-screen presentation, with referee and commentator cameos. Nicely defined but poorly animated. Annoying sample theme tune and unimpressive match sounds. Inaccurate player selection and poor sprites are distractions to what should be an immediately playable game. Limited enjoyment with such unadventurous controls.